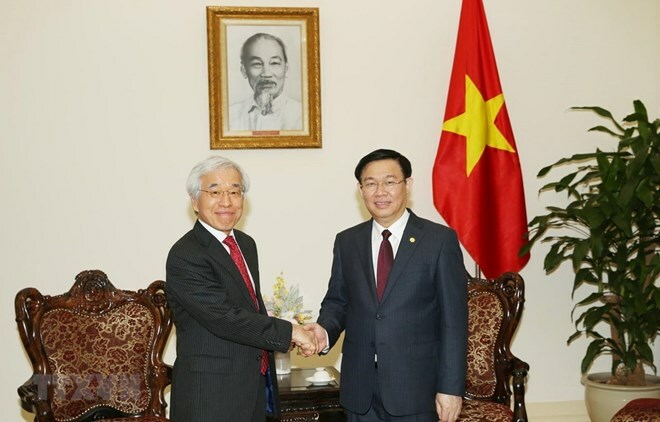 Hanoi (VNA) – Deputy Prime Minister Vuong Dinh Hue welcomed Japanese-based J Trust Corp’s aspiration to involve in the restructuring of Vietnam Construction Bank (CBBank) during a reception in Hanoi on March 29 for its Senior Managing Director Nobiru Adachi. The Deputy PM said the Vietnamese government provides every possible support for domestic and foreign investors, especially those with strong financial and governance capacity as well as experience in banking, to take part in restructuring weak Vietnamese banks. He told the guest that the government advocates finding partners to sell or restructure the CBBank, which will be decided by the Cabinet and the PM based on suggestion made by the State Bank of Vietnam (SBV). The government and investors want the most feasible and beneficial solution to parties concerned, he said. The host asked Adachi and collaborators to continue discussing their offer plan with the CBBank and the SBV to submit to the government and the PM for consideration. As a number of investors are also interested in CBBank, he urged J Trust to take relevant steps soon. Apart from CBBank, he also welcomed J Trust’s involvement in restructuring other credit organisations in Vietnam. Adachi, for his part, said J Trust now offers commercial banking, retail finance and debt collection services across Asia, from Mongolia to Indonesia. It successfully revived several financial-consumption companies and restructured weak banks in the Republic of Korea and Indonesia. If permitted, J Trust not only wants to contribute capital but also technology to CBBank and will do its best in the effort, he said, expressing his hope that the Vietnamese government and the SBV will create favourable conditions for the success of its negotiations and transaction.